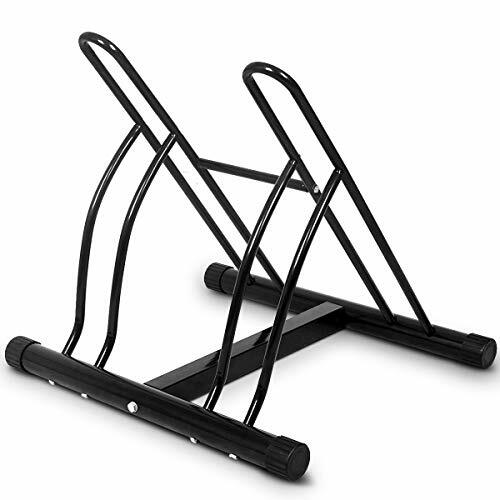 This New Bike Storage Stand is ideal for u to park and store your bikes as it can hold 2 bikes. It is convenient for u to store your bikes with this perfect helper. The heavy duty construction with dual purposes provides safety and convenience and save more space when bikes are not used. It can also protect bikes from scratches and damages from other products stored in the garage. U could park your bikes in different directions and arrange the parking more wisely. Competitive price with high quality is realized here.Welcome! 【Durable Steel Construction】Frames are made of premium steel, which not only ensures the long term use of this item, but also adds stability. 【Black Paint Finish】All frames are covered with high quality black paint, the rack resist in all weather condition. 【Fits most tires】This two bikes floor rack fit most bike tires with dimensions 23.6'' x 21'' x 22''(L x H x W), excludes commuter bikes with larger or wider tires. 【Easy to assemble】The package come with all necessary screws and instruction, you may assemble the rack in minutes by yourself. 【100% Warranty】We offer you 100% risk-free satisfaction guarantee to let you buy with confidence. We are quite sure that you will be super-impressed with DURABILITY and HIGH QUALITY of our bike floor rack.